This is the 4 inch by 4 inch version of the Chickadee handmade tile. The bird on this size tile is approximately the size of an actual chickadee. This tile is excellent for people who love to feed or watch these playful and delightful birds, especially in the colder months. This design is also available in the 2"x2" and 3"x3" size. 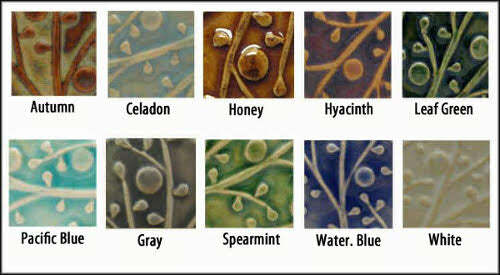 As always, the glazes used are all non-toxic and lead free. This Chickadee tile has a generous wedge slot on back for easy wall hanging on a nail or screw. This Arts and Crafts style, high-fired stoneware tile, is also good for permanent installation on the walls of any room in the home. It approximately 1/2 inch thick, except where the three dimensional relief design makes it slightly thicker.